Following the highly successful interactive session at the 2015 Dredging Days, CEDA’s new Dredging Management Commission will be hosting a new session this year. The industry faces ever increasing risks and constraints including in respect of contracting, risk allocation, tightening margins and general contract and commercial management. These factors, amongst others, often result in an increase in commercial risk and uncertainty for contracting parties, frequently manifesting as unforeseen expenditure on one or each side of a contracting relationship. The focus for this year’s event is therefore related to contractual problems and, critically, how to avoid them occurring. The interactive session uses an engaging theoretical case study incorporating issues and problems which are commonly experienced in dredging and offshore projects. 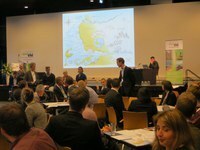 Teams of participants will debate and evaluate the causes and cures of such problems. These evaluation forums will be carried out, discussed with and reflected on by a team of industry experts who, along with the participants, will explore and identify aspects of contracting best practice and procedure. Designed to be accessible and beneficial to all parties to a contract (owner, contractor, subcontractor/supplier and engineer/designer) the session will draw together the combined experience of both the expert panel and the attendees, each of whom will bring their unique insight, problems and solutions to some of the most pressing, relevant and commercially important aspects of the delivery of a dredging project currently being faced on real schemes. The interactive session will be suitable for all levels of seniority and experience, giving valuable developmental markers for those early in their career, while assisting in providing practical and effective advice and assistance to those in more senior roles who have responsibility for contract placing, contract administration and project management. 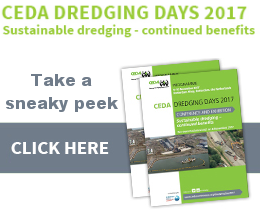 CEDA welcomes and invites all to join and participate in what is expected to be a popular and highly anticipated new interactive session at the 2017 Dredging Days in Rotterdam. See more photos of the session here.